Canton Junction had already created some buzz when this YouTube video was posted last fall. The group’s performance of the Southern Gospel classic, “Sweeter As The Days Go By” showed huge potential in this vocal line-up. An all-star vocal line up made up of Matthew Hagee (tenor), Aaron Crabb (lead), Michael Sykes (baritone) and Tim Duncan (bass). The only question at the time was when one could expect an album from this group. 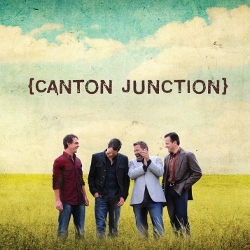 That question is finally answered with the release of Canton Junction’s self titled debut album on Tuesday (09/04/12). This two disc collection of twenty songs gives the listener a broad range of styles from traditional, to progressive, to some country tones and even a little inspirational. 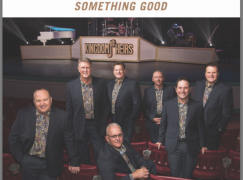 Even with the broad range of styles, the group doesn’t sound much different from what is offered by the Gaither Vocal Band or Ernie Haase and Signature Sound. Each disc tends to have one stand out track. Aaron Crabb’s feature on “Show Me Your Way” is the stand out on disc one while that recorded live version of “Sweeter As The Days Go By” is hands down the best song on disc two. Aaron Crabb also turns in some strong performances on “The Inviting Christ” and the group’s current radio single, “Hold On”. Tim Duncan’s biggest vocal moment comes on “Sweeter As The Days Go By”. It would have been nice to let Tim ‘show out’ on more quartet numbers. Tim is also heard on the ballad “The Son Shines Down On Me”. I was surprised at the tenor work put in by Matthew Hagee. While not a traditional Southern Gospel quartet tenor, he turned in a great performance on the song “Heaven Is”. Strongest songs included in order: “Sweeter As The Days Go By”, “Show Me Your Way”, “In The Valley He Restoreth My Soul”, “Hold On”, “Heaven Is” and “Dig A Little Deeper In God’s Love”. Too many worn out song covers. Song covers are the name of the game in 2012 for many artists. With the exception of the three song covers listed above, the listener did not need another cover of “I Wouldn’t Take Nothing For My Journey Now” and “Who Am I”. It seems like artists think they are the only two songs ever written by Rusty Goodman. Folks, “Had It Not Been”, “Home”, “How Much More”, “I Believe He’s Coming Back”, “It’s A Wonderful Feeling”, “Leaving On My Mind”, “Look For Me”, “Wait’ll You See My Brand New Home” and plenty more were written by Rusty. I also wasn’t impressed with the inspirational “You Are So Beautiful” and “What A Wonderful World”. I didn’t understand their placement on the recording. While I am all for giving the listener as much music as possible on a recording, if the recording was narrowed down to the twelve best performances, it would be hard pressed to find anything wrong with this debut effort. Weakest songs included in order: “You Are So Beautiful”, “What A Wonderful World”, “Go Tell It On The Mountain”, “Who Am I” and “Glorify”. Vocally, Canton Junction is already capable of competing with the biggest quartets in Southern Gospel music. Reminiscent to groups like Ernie Haase & Signature Sound and the Gaither Vocal Band could garner the group many fans. The biggest issue with this twenty song debut recording was song selection. The production was top-notch and the arrangements fit the group. The only other downside I see to Canton Junction’s visibility would be touring. With the individual members obligations outside the group, it will limit the amount of time they are going to be able to tour. I look forward to hearing what this group will offer listeners going forward and any time the group is close I will definitely be making plans to see them live. Yeah, “You Are So Beautiful” is just a pop song, and I HATE it when Christian artists literally grab love songs and port them over to a gospel/Christian context. It’s almost worse than writing vague worship songs. With these you KNOW they were never intended to be sung to God. Not sure of the times for each song, but they most likely could have put all of these on one disc, or left off one or two songs and made them all fit. Even if all the songs are 4 minutes, you can fit 20 songs on a CD…and they probably are not all that long. Depending on what it sells for will determine whether or not I will be buying it. Digital download is available on Sept 4th on Amazon.com and I assume the other outlets.